With more than 500 different species of birds found in Belize, it is clear that this Central American destination is a dream for birdwatchers. Whether you are a casual observer or a serious enthusiast, you won't have trouble spotting magnificent birds and beautiful plumage. Find out more about the types of birds you can expect to spot in Belize, the best destinations in the country for birdwatching and the ideal time of year to spot birds. Of the over 500 bird species in Belize, roughly 80 percent are full-time residents in the country, which means that they don't migrate. This is great news for visitors, as it ensures that any time of year is the right time to go birdwatching. However, those eager to spot unique birds or those less frequently seen in Belize might want to visit during September and October, major migratory months for many birds. You can go birdwatching any time of day, but going out in the early morning or twilight offers the best chance to see a variety of birds, and it keeps birdwatchers out of the midday sun at the same time. With so many birds in Belize, it is not hard to spot dozens of species without going far. Osprey are perhaps the most commonly spotted birds in the country, and electricity poles are often covered in nests made by osprey. Common sea birds found along the coastal areas of Belize, including the island of Ambergris Caye, include frigate birds and red-footed boobies. Other common birds include turkey vultures, keel-billed toucans, trogons, kingfishers, hummingbirds, woodpeckers and parrots. The rarer and more unusual birds in Belize that birdwatchers come specifically to spot are species like the jabiru stork, which stands at a whopping five feet tall, and the scarlet macaw, an endangered bird that numbers perhaps just 200 and is typically found along the border between Belize and Guatemala. One of the great things about birdwatching in Belize is that you'll often spot beautiful birds without going out of your way. On the way to the pool, as you tour ancient Mayan ruins or as you enjoy a meal on the beach, you'll have incredible access to the nation's birding atmosphere. However, it is certainly worth a trip to some of the most incredible birdwatching destinations in the country. Lamanai, an area of ancient Mayan ruins, is home to more than 360 bird species alone. Although Lamanai does have a number of tourists, birds are still rather outgoing and not at all shy. Within the Shipstern Nature Reserve, birdwatchers can hop in a kayak or canoe and see a variety of birds with limited distractions. Other fantastic spots include Cockscomb Basin Forest Reserve for tropical forest birds, the Crooked Tree Wildlife Sanctuary for wetland birds and Half Moon Caye National Monument for countless nesting birds. Belize truly is a paradise for birdwatchers. 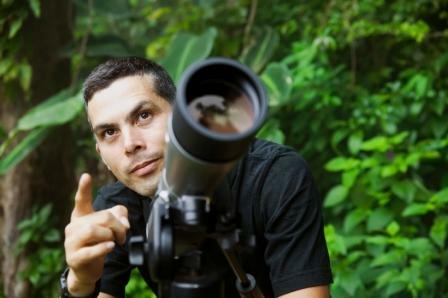 To see some of the rare or migratory birds while in Belize, a guided tour is often ideal. Of course, even without a guide, you can easily spot an array of beautiful and colorful birds in their natural environment. In the off chance that you miss a particular species, the impressive number of birds in the Belize Zoo is a fantastic backup option. Explore the many wonderful things to do in Belize!